RetroArch 1.7.2 has just been released! Grab it here. This latest version has also been uploaded to the Google Play Store. A visual representation by Durante of how the runahead system works in practice. This might just be our biggest release yet, thanks in no small part to the new runahead latency reduction system. This feature has already been all the rage over the Internet. Well known people like Durante of DSfix fame praised it and the popular site Ars Technica has dedicated an entire article to this game-changing feature. We ran an article on this new feature before, and since then, several facts have changed on the ground which bears pointing out. First of all, several performance improvements have been made since. Secondly, the feature has now been enabled for the vast majority of the RetroArch platform ports. Every game has a certain built-in amount of lag frames. In order for the runahead system to perform as expected, you should set it to the same amount of frames to read ahead that the game you’re running is working by. So, for example, if a game like Super Mario World for the SNES has a guaranteed 2 frame input lag, for the best results, set Runahead frames to 2. You can count the amount of lag frames a game has by using the frame advance feature in RetroArch. For playable performance, your system should be at least capable of running the core at twice its regular speed. These performance demands go up commensurate to the amount of frames you want to run ahead. The higher performance you get with a core, the more frames you can run ahead at fullspeed. While the runahead system is core agnostic and therefore technically we don’t need to patch up cores in order to work with the runahead system, there are several things that can be done in order to improve performance considerably. To this end, Dwedit has submitted several patches to some of the cores in order to make them perform much better. Some of these cores include (but are not limited to) the Snes9x cores, QuickNES, FCEUmm, Nestopia, Gambatte, and even Mednafen/Beetle PSX. An often heard question that has been asked is – will this work on a Raspberry Pi? There is no straight answer to this since it heavily depends on the core’s performance. Based on our performance tests on the PS3 and Xbox OG, QuickNES and Gambatte should be at least two cores that should run at fullspeed with runahead set to 6 frames or less. Your mileage may vary on any of the other cores. The quick rule of thumb is that the faster the core, the higher chance there is to get it to run at fullspeed with more runahead frames. Pause emulation (press ‘p’ button on keyboard). Press and hold the jump button on the controller. Advance emulation frame by frame (press ‘k’ button on keyboard) until the character jumps. 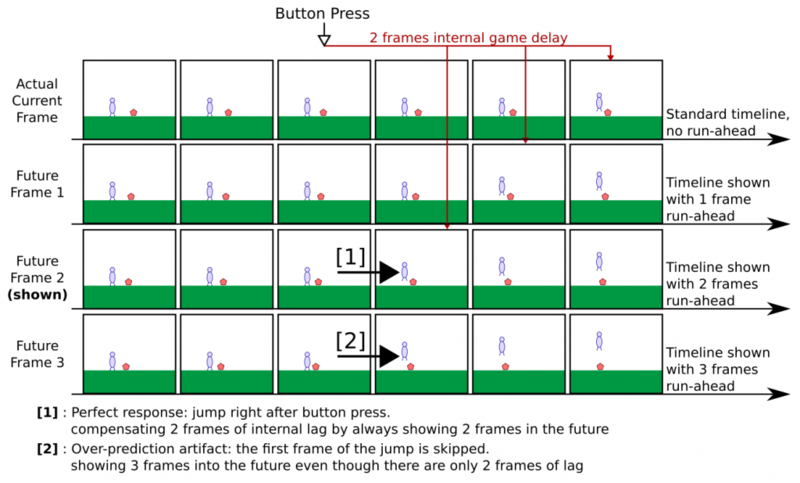 The number of k presses before you get a reaction should be the number of lag frames you can safely remove with run ahead. So, how well does all this scale? Of course, the more expensive hardware you throw at a latency reduction approach like this the better, but how low can we actually go in terms of specs and still obtain good results? To figure out a basic answer to this question, I decided to test the runahead system on two old game consoles that are not exactly powerhouses at this point. The first of the lot is the Xbox OG, powered by a fairly mundane Pentium 3/Celeron 733MHz CPU. The second is the PlayStation3. Its PPU is roughly equivalent to a Pentium 4 2.4GHz CPU in terms of real-world performance, and even that comparison is probably pushing it. So this is not exactly powerful hardware. We consider any PC from the year 2005/2006 (whether desktop or laptop) to be significantly more powerful than either of those consoles, so these test results bode quite well for the scalability and feasibility of the runahead method. Features like the runahead system will also naturally increase the demand for ever faster cores so that people on lower specced hardware can use runahead with more frames in advance. CRT Switch Res – GroovyMAME-like features for 15KHz capable CRT monitors! Thanks to forum-user Alphanu, RetroArch now has the ability to query cores for their exact video timing data, which can be used to switch to native-resolution, 15 kHz modelines for use with standard-definition CRT TVs. This is a big step for retro purists, as RetroArch can now output “pixel-perfect” video with accurate timing to compatible displays, even quickly switching between interlaced and non-interlaced modes on the fly. This capability is currently Windows-only and requires modelines to be created in advance by CRT_EmuDriver or Custom Resolution Utility with a compatible GPU. Linux support is coming soon. With RetroArch 1.7.1, we really stepped our game up to finally start treating Windows as a first-class citizen platform. You have seen this in the form of dedicated Direct 3D 11/12 video drivers that had the ability to run the same shaders as Vulkan, our new slang shader spec that is made possible by the impressive Khronos/ARM-backed project SPIRV-Cross. Previously, the Direct3D 11 driver required that your graphics card driver supported at least Shader Model 5.0. We have since downgraded this requirement to Shader Model 4.0. As a result, I am now able to use the Direct3D 11 video driver on an old 2010 laptop GPU that only supports Shader Model 4.0 (it’s an ATI Mobility Radeon HD 4300). We also try to support more D3D11 feature levels instead of just defaulting to 11.0. On some systems, though, you won’t be able to make use of the Direct3D 11 driver no matter what. One of those systems happened to be another old laptop I had lying around here. This one has a Geforce 9200M GS, and the specs state that it supports up to Direct X 10 and Shader Model 4.0. Direct3D 11 is a no go on this GPU even with the increased backwards compatibility. It’s for this purpose that me and aliaspider spent some time to finally make the Direct3D 10 driver feature-complete. Direct3D 10 should be available from Windows Vista and up, whereas Direct3D 11 is available from Windows 7 and up. The Direct 3D 10 driver should be feature complete and identical to the Direct3D 11 driver, with the sole exception of hardware rendering contexts not being available right now with Direct3D 10. Direct3D-powered libretro cores are now possible! This feature is easily worth its own article, but since we already covered this before and because 1.7.2 has so many huge features, we will relegate this to a side note. Nevertheless, it is none the less important. Up until now, if you wanted to use hardware-accelerated 3D rendering in a libretro core, your options were OpenGL and/or Vulkan. There is now a third option – Direct3D 11, and the first libretro core that supports this is the PPSSPP core! With all these features, we now have everything in place to really do an UWP version of RetroArch justice. Most of these restrictions have now been lifted at long last thanks to radius, and the visual representation is also much improved now. To read more about this, also visit the related forum thread here. Do note that all your existing remap files are now obsolete, and you should start from scratch. This was a necessary evil unfortunately in order to progress. XMB and MaterialUI menus should scale much better now depending on the output resolution. Previously, the XMB and MaterialUI menu elements were too small if you were running at a resolution of 1440p or 4K. Boxart / thumbnails now react better to other elements on the screen and can resize or adjust themselves accordingly. There are also new ways of showing a thumbnail on the left and right side of the screen in XMB. It is also possible to determine what ‘type’ of thumbnails get shown on the left and right, respectively. There are two layout modes now for XMB – you can choose between Desktop and Handheld. Desktop is the default look of the XMB as it was now, mirroring the PS3 layout, while Handheld goes for an XMB look that is more in line with how it looked like on PSP. Previously, the default layout was ‘automatic’, where it would default to the PSP layout if you were running at a resolution of 320×240. Shaders should work again with the Vulkan video driver on the Android version. When you select a shader preset now, it should only show you the supported shader presets based on the video driver that is currently selected. In other words, it will no longer show you GLSL shaders and/or presets when you have selected the Vulkan video driver, just as an example. Certain video features were never implemented for some platforms. We now hide features like Black Frame Insertion, GPU Hard Sync and Swapchain images if the video driver in question doesn’t implement them. It is conceivable that for some of these drivers, these features might be implemented later, but overall we feel it declutters the menu considerably by simply not showing settings that have no effect at all when toggled due to them being unimplemented. We now expose certain convenience features on the Quick Menu, such as Latency, Rewind and Overlay settings. You can also hide these settings respectively by going to User Interface -> Views -> Quick Menu and disabling these categories. The shader next/previous hotkeys are more intelligent now and deliberately skip over shaders that are not supported by the current video driver. (For Linux users) Wayland should now have proper scaling with XMB menu driver. (For Linux users) Allow compositor disabling on X11 fullscreen through _NET_WM_BYPASS_COMPOSITOR. On platforms where this is supported, ‘Set Display-Reported Refresh Rate’ is a convenient way of setting the exact refresh rate that the OS/video driver has reported to the application. This might be more accurate than measuring the refresh rate yourself by waiting for 2048 samples or more before hitting the Action button on ‘Estimated Screen Framerate’. Display Framerate is now moved to ‘Onscreen Display – Notifications’. A handy feature showing all sorts of statistics is now exposed in this submenu as well. The future is now. Arcade achievements using the FB Alpha core are fully supported in this version. This brings support for Neo Geo and Capcom arcade boards (Metal Slug, Marvel Super Heroes). – Capture your greatest moments with the automatic screenshot feature! Look back fondly on the time you grinded your RPG character to level 99 for internet points. – RetroAchievements on a retro computer?! Windows XP builds of RetroArch now support achievements! ANDROID/OPENSL: Prevent crashes when setting audio latency too low (buffer count can never be lower than 2 now). COMMON: Hide the ‘Core delete’ option if the ‘Core updater’ is also hidden. COMMON: Add way to reset core association for playlist entry. COMMON: Add OSD statistics for video/audio/core. COMMON: Added runahead system; allows you to drive down latency even further. COMMON: Fix buggy behavior that could happen with ZIP file reading on some platforms as a result of not initializing struct. CHEEVOS: Support Atari 2600, Virtual Boy, and Arcade (only Neo Geo, CPS-1, CPS-2 and CPS-3 and only with fbalpha core). CHEEVOS: Add option to automatically take a screenshot when an achievement is triggered. CHEEVOS: Fixed incompatibilities with Neo Geo Pocket achievement sets. CHEEVOS: Store only login token, not password. D3D10: Added D3D10 driver to release build. Has working shaders (Slang), overlay, and menu display driver support. Should be on par capabilities wise with D3D11 driver except for there being no hardware rendering right now. D3D11: Experimental hardware renderer. Allows for libretro cores to use D3D11 for hardware rendering. First core to use this is PPSSPP. D3D11: Increase backwards compatibility, shaders compile with Shader Model 4.0 now, added support for more feature levels. D3D10/D3D11/D3D12: Fix crashes with completely black or white thumbnail textures in XMB. GUI: Support disabling window decorations on Windows and Linux. LIBRETRO: Addition – Functions to enable and disable audio and video, and an environment function to query status of audio and video enables. MENU/RGUI: Add User Interface -> Appearance options. MENU/XMB: Disable XMB shadow icons by default for PowerPC and ARM for performance reasons. MENU/XMB: Left/right thumbnails are now automatically scaled according to layout. MENU/XMB: Add Left Thumbnails (additional to the right). MENU/XMB: Fixed left/right tab regression. MENU/XMB: Fix scaling of tall images that were cut on bottom previously. MENU/XMB: Menu scale factor setting now changes texts length, image scaling and margins. MENU/XMB: Mouse cursor scales correctly now. MENU/XMB: Add toggle to show/hide Playlist tabs. MENU/XMB: Add menu layout – can switch between Desktop, Handheld and Auto. MENU/MaterialUI: Automatic DPI Scaling should be much improved now, now scales as expected at 1440p and 4K resolutions. MENU/MaterialUI: Fix wrong calculation of an entry height causing long playlists to end up outside of screen range. This also could cause crashes on low DPI screens. IOS: Fixed crash when opening downloaded roms from Safari or using the “Open in..” functionality. Added the compiler flag to support keyboard remapping to controls. IOS: Fixed buffer overlap that caused a crash while trying to download GLSL shaders from the buildbot. SCANNER: Should be able to scan dual-layer Wii disc images now, filestream code now supports files larger than 4GB. SHADERS/SLANG: Slang shaders should work again on Android version and MSVC versions (basically all the Griffin-based versions). SHADERS: If GL context is GLES2/3/Core context, Cg shaders are unavailable. Applies to shader list too. SHADERS: Hide cg/glsl shaders from being able to be selected if D3D8/9/10/11/Vulkan video drivers are selected. SHADERS: Hide slang shaders from being able to be selected if D3D8/9/OpenGL video drivers are selected. VULKAN/X11: Fix X11 Vulkan bug from Wayland driver. VULKAN: Fix multi-line text spacing in menus with Vulkan driver. WINDOWS XP: Add Cheevos support. WINDOWS/MSVC 2003/2005/2010/2013/2015/2017: Add Cheevos support. VITA: Bugfix for ‘PS Vita takes many time to start to accept input’ issue. WIIU: Fix OOB read/write in keyboard driver. A Qt-powered WIMP desktop UI! Ever since RetroArch’s inception in 2012 (and even way before that when it was just known as SSNES), we have stuck to our guns and insisted on a uniform menu experience that obviously took its design cues from mainstream gaming consoles like the PlayStation. While this lends itself very well to game consoles and the like, there is also a very vocal minority (or majority, depending on how you look at it) that has definitely made it well known that they would really prefer a native WIMP UI at times to be able to do mundane tasks like select/load a ROM, or browse through a playlist easily with the mouse, etc. And certainly, an argument can be made that on a traditional desktop PC, it might not be ideal at all times to be confined to the same kind of input limitations as say a traditional gamepad. For 1.7.3, the way we will try to reach for a concession with these users will be through the way of this companion UI. What you see in these screenshots will be a WIMP (Windows, Icons, Menus, Pointers) GUI powered by Qt. It will be available for RetroArch versions that run on PC Operating Systems like Linux, Windows and macOS. The way we envision this UI to work is a bit like how it is possible in Steam to switch between Big Picture mode and the traditional desktop UI. We still want the console-style menus to be RetroArch’s main user interface and we believe this scales fairly well onto game consoles, mobile devices and handhelds. But there is no denying, as Windows 8 all taught us, that there is no such thing as one true universal UI that can scale well across every potential device, so the user should definitely have his/her options. The two screenshots you see here are not just mockups, they are already operational in bparker’s branch. What you see here is the result of about one solid month of work, and it’s already reaching quite satisfactory levels. We have kept a tight lid on it until now, but felt the time was right to reveal more details about it. We are doing this primarily for the users, and we hope that they will like it, and through designing this we are also trying to be more receptive to user feedback than we might have been in the past. Despite all this, as with anything in our codebase, we do insist that from a programming point of view, that this will not impose any huge dependencies, and that all of these individual coding parts are modular in nature and can be easily compiled in or out of any build. With RetroArch we always have to walk a fine line between staying lightweight and not becoming perceived of being too bloated yet also trying to meet increasing user expectations, and it’s not necessarily always possible to be in the middle of these two opposing camps. So we try to do our best to satisfy both groups this way, and stay true to our design goals while also making sure that we keep the users happy who don’t care about the underlying codebase but just care about the results from an enduser perspective of what they can do with the program. It’s a big challenge and definitely a balancing act but we feel we have become better over the years in terms of finding the right balance. Libretro, the underlying platform and ecosystem that powers most of what you see in RetroArch, will see an explosive growth throughout the rest of this year, both by our efforts and outside forces also only tangentially related to our project. You will see the Libretro logo not only in more places, but you will also see popular programs like Kodi finally adopting the API wholesale. While it was never our direct intent to have our API be synonomous with retro gaming and emulators, we do not mind this being the biggest driver of growth in this emerging ecosystem and are grateful for the developments there. Libretro API now supports experimental Direct3D11 hardware rendering! We, as the developers of RetroArch and Libretro, are proud to announce that yet another new option is available to developers who are using the Libretro API. In addition to being able to use Vulkan and/or OpenGL for hardware rendering, you can now also use Direct3D 11 inside your cores! While it should be noted that this is still in an experimental stage, there is already a core that will be taking advantage of this — the PPSSPP libretro core, which has recently been upstreamed thanks to Ali Bouhlel and Henrik Rydgard, the original developer. You will be able to use either Direct3D 11 (on Windows), OpenGL or Vulkan renderers with the PPSSPP core. Libretro as an API started out in 2010/2011 only allowing for software rendered graphics. This is truly platform and hardware-agnostic, and for most systems that do not use any kind of 3D rendering and have little to gain from moving over to hardware-accelerated graphics APIs this is the preferable strategy. However, because software rendering has to be handled by the CPU, is only really practical for older games/emulators emulating older 2D-based systems. 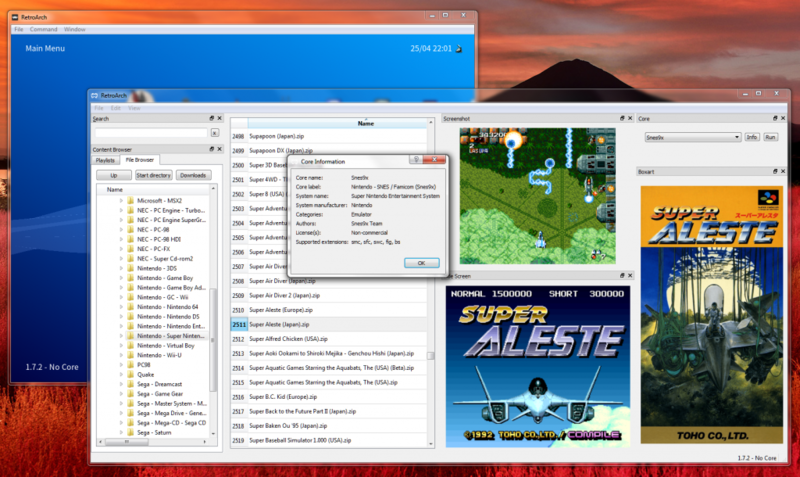 OpenGL hardware rendering was added as an option to the Libretro API back in 2013. This coincided with Android and iOS ports appearing for RetroArch, and this was before the platform holders all decided to go their own separate ways and start targeting their own APIs. So being able to target OpenGL (ES and non-ES) as a developer in your libretro core was a great and convenient way to make cross-platform code that would run on most platforms. The only requirements for using OpenGL in your core was that you would adhere to at least OpenGL 2.x on the desktop and/or OpenGL ES 2.0 on mobile. While fixed-function OpenGL was theoretically possible, we only ever provided a test core for it, and we had an unwritten agreement in general that OpenGL usage in Libretro cores should be non-fixed function. 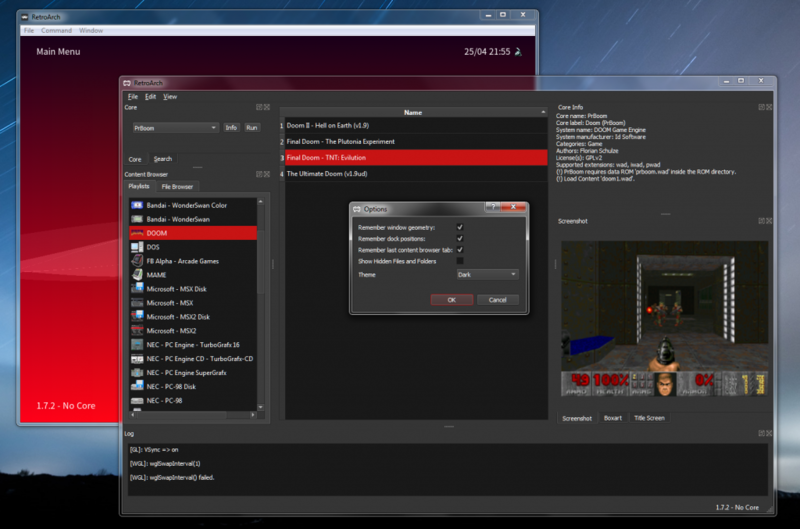 In 2016, the next-generation Vulkan graphics API was launched, and nearly at the same day, RetroArch and Libretro as an API started supporting the Vulkan API. Later that year, new Vulkan renderers for two of our emulators, Beetle PSX and Parallel N64, were made. Since then, Vulkan support has been added to other libretro cores as well, such as PPSSPP and the Dolphin core. Now in 2018, there is an additional third option available to developers — Direct3D11 support! Targeting this API will of course limit you to Windows 7 and later. However, there are valid reasons for targeting Direct3D 11. On some devices like the Surface Pros, OpenGL drivers are apparently notoriously bad and you need to use Direct3D rendering in order to get decent performance. To this day, users of AMD GPUs on Windows still complain about OpenGL renderers performing worse than their Direct3D equivalents. Whether this is deliberate through sabotage or it’s just circumstantial misfortune, there are legitimate reasons for targeting Direct3D 11 from a performance perspective, and since UWP supports D3D11 natively and using either Vulkan or OpenGL would only be possible through several abstraction layers, it is nice in our humble opinion that the option exists vs. it not existing at all. We would of course much prefer that there was a real crossplatform graphics API that magically worked everywhere, had great performance everywhere, and that required somebody to just write a graphics renderer once. Unfortunately, industry powers for whatever reason never seem to want things to actually get too easy for developers, so until then, covering all our bases with the Libretro API and trying to support as many of the predominantly available graphics APIs as possible seems to be a more pragmatic decision. And what’s more, thanks to the excellent SPIRV-Cross project, we are fast approaching a situation where the Direct 3D 11, Direct 3D 12, Vulkan and (maybe soon?) OpenGL drivers available in RetroArch will be capable of using the same shaders instead of each needing their own separate shaders.